How to Register With DIGITAL SEVA PORTAL & VLE ? What is digital seva ? What is digital seva portal ? Who is this VLE ? 7. And at last, You should have minimum internet connection of 128 kbps speed for internet browsing and so on. But now the question arises that what are the responsibilities after becoming a VLE ?? Well, read more ! The most responsibility of a VLE is to deliver the services to the people or users which are available in Digital Seva Portal smoothly. Also you should avail your Kiosk from 8:00 AM to 8:00 PM. 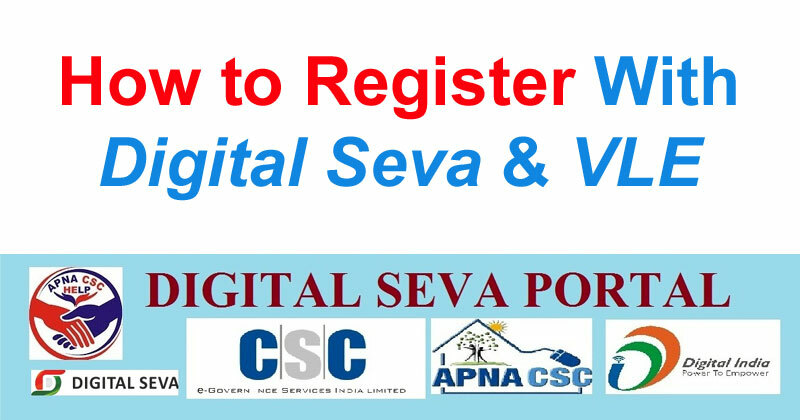 How to sign up with Digital Seva portal ? 1. Open the official site of digital seva portal . 2. Now click on the registration option in the menu and click on the apply button displaying on the homepage of the website. 5. Now fill up the required details like banking documents , etc. 6. You will receive an email and sms to your registered email id and phone number regarding the successful registration. 7. You will also get your application number via sms/email so that you can track your application status. Digital seva portal which is conducted by CSC(common services center) also provides many more services to us . These services are related to Aadhar, agriculture, banking &amp; pension, education, election, health etc. Well, If you want to know about all of these services and how you can get benefits from this , then you must read this CSC Digital Seva Portal : A to Z Full explained !